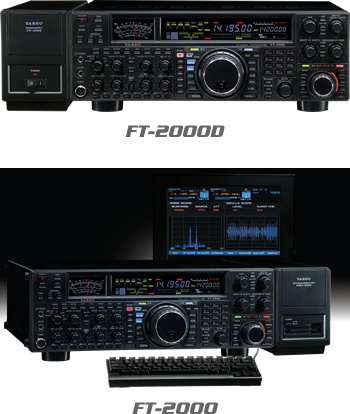 The FT-2000 and FT-2000D are the 2nd Generation in the proud lineage of the FTdx9000 Series! Featuring extensive DSP filtering, 100 & 200 Watts of power output respectively, and a host of outstanding ergonomic and performance features, the FT-2000 and FT-2000D are destined to be the centerpiece of your HF/50 MHz station! The FT 2000 and FT 2000D are no longer in production however they are still supported by Yaesu. 160 - 6 Meter Coverage, 100 or 200 Watts of Power! The FT-2000 and FT-2000D provide a full 100 & 200 Watts of power output (AM: 25 W) on the 160-6 Meter Amateur bands, and the U.S. version includes a special memory bank containing the five 60-meter channels, as well. Continuous receiver coverage from 30 kHz to 60 MHz is provided. Note: frequency coverage may differ in your country. The power of IF Digital Signal Processing (DSP) is yours to enjoy with the FT-2000/D. Variable IF Width and IF Shift allow precise interference rejection, and the receiver DSP also includes an Auto-Notch, Manual Notch, Digital Noise Reduction, and a continuously-variable passband Contour control. The WIDTH control has a mode-determined adjustment range of 200 Hz – 4 kHz for SSB, and 25 Hz to 2.4 kHz on CW, and a mode-optimized “Narrow” key provides one-touch narrowing of the bandwidth to a user-determined preset value. With the FT-2000/D, you have tremendous control over the fidelity and/or “talk power” of your SSB signal, thanks to the variable SSB bandwidth capability in the Menu. The default bandwidth is 2.4 kHz (300 – 2400 Hz @ -6 dB), but you also have selections of 50 – 3000 Hz, 100 – 2900 Hz, 200 – 2800 Hz, and 400 – 2600 Hz, allowing you to select the bandwidth best suiting your operating needs. The power of DSP also provides tremendous benefits for transmission, as well as reception. The Three-Band Parametric Microphone Equalizer allows unmatched capability to tailor your speech characteristics: in each of the three bands, you may adjust the center frequency of the equalization, the frequency spread over which the equalization is applied, and the amplitude (peaking or nulling) within that equalization range. The result is sparkling, clear audio that will be the envy of everyone else on the band! Outstanding Strong-Signal-Handling Capabilities Derived from the FTDX9000! Following in the renowned path of the FTDX9000, the FT-2000/D is crafted with a comprehensive design view that accounts for all aspects of the strong signal environment, and especially with optimization of weak-signal in a multiple-strong-signal environment. The receiver of the FT-2000/D is a triple-conversion type, utilizing great care in the gain distribution through all IF stages. The first mixer is a GaAs FET Doubly-Balanced Mixer type, fed by a four-VCO PLL synthesizer (30 kHz – 10.5 MHz, 10.5 MHz – 24 MHz, 24 MHz – 39 MHz, and 39 MHz – 56 MHz). The resulting first IF is at 69.450 MHz, utilizing an up-conversion technique that yields excellent image rejection. The first IF of the FT-2000/D features three roofing filters, I bandwidths of 15 kHz, 6 kHz, and 3 kHz, optimized by mode for best performance on today’s crowded bands. Especially useful during busy contest weekends, the Roofing Filters are positioned right after the first mixer, improving IP3 (3rd-Order Intercept Point) performance for all stages that follow. The Ultimate Low-Band DXer RF Preselection Filter: YAESU’s Exclusive µ-Tuning! On the lower Amateur bands, the signal voltages impinging on a receiver can create noise and Intermodulation effects that can cover up weak signals you’re trying to pull through. So YAESU’s engineers developed the µ (Mu) Tuning system for the FTDX9000, and it’s now available as an option for the FT-2000/D. Three modules are available (MTU-160, MTU-80/40, MTU-30/20), and these modules may be connected externally with no internal modification required! When µ-Tuning is engaged, the standard VRF (Variable RF Preselector) system is bypassed, but the fixed Bandpass Filters are still in the received signal path. The µ-Tuning filters utilize a stack of large 1.1” (28 mm) Ni-Zn Ferrite cores, driven through a silver-plated coil assembly by a precision stepper motor. The resulting high Q (typically over 300) provides a very steep resonance peak near your operating frequency. The peak may be adjusted away from your frequency, for even greater protection from a specific station, and a graphical depiction of the µ-Tune filter alignment appears on the front panel of the transceiver. When operating at a frantic pace, it’s a comfort to have such comprehensive information available on the front panel’s huge display. The FT-2000/D’s unique "Receiver Configuration Display” calls out status for each step in the receiver’s RF and IF, and the fluorescent display also provides both graphical and numerical depiction of the bandwidth and the alignment of the various interference-rejection filters. And the high-resolution analog multi-meter allows you to monitor PO/COMP/SWR/ID/VDD/ALC both effortlessly and precisely. During Split operation, Dual Receive may be engaged so that you may listen to both sides of the pile-up (or watch a particular frequency on the same band for activity). One push of the appropriate [TX] or [RX] indicator will engage or disengage the receiver or transmitter on the Main or Sub VFO, and the [TXW] (TX Watch) button also lets you listen to your transmit frequency during casual Split operation. The Sub Receiver also has a slot for an optional Collins® Mechanical CW filter, if desired: choose the YF-122C (500 Hz) or the YF-122CN (300 Hz). The Sub Receiver is an analog type, with no DSP filters. Enhance Operation using External Display (option)! A wide array of informative and useful displays, identical to those available on the FTDX9000D, can be obtained by adding the optional DMU-2000 Data Management Unit and an after-market display (not supplied). You get an Audio Scope (plus “Waterfall”) and Oscilloscope, Logging Page, Band Scope, World Clock with Sunrise/Sunset Terminator Display, Swept-frequency SWR display, Memory Channel listing, Rotator Control display with Great Circle Map, and a comprehensive Menu listing, as well. Enjoy the ultimate in operating ease by adding the DMU-2000! The 99 memories may be organized into up to five memory groups (up to 20 channels each), and with the addition of the optional DMU-2000 Data Management Unit, you can connect your keyboard (not supplied) and add memory labels (names), edit data, and perform backup and other functions, as well, using an external computer monitor (not supplied). In addition, the one-touch Store (STO) and Recall (RCL) keys allow you instant access to a five-channel Quick Memory Bank that gives you access to five frequencies on a first-in, first-out running basis. A Host of Features for the CW Enthusiast! The front and rear panels have their own key jacks, which may be set up independently for connection of a keyer paddle (for use with the internal keyer), a straight key or bug, or a computer-driven keying interface for use with contest logging software, etc. With the FT-2000/D, you can use both your ears and your eyes to zero in on another CW station. The CW SPOT switch engages a spotting tone that matches the offset of your transmitted signal (as set by the CW Pitch selection), allowing you to match that pitch to that of an incoming signal perfectly. And the CW Tuning Indicator provides a graphical depiction of the tuning process, with a ? marker lighting up when the incoming signal is precisely aligned with yours. For storage and playback of repetitive messages you have to transmit in a contest, the four-channel Digital Voice Recorder (5 channels when using the optional FH-2 Keypad) will quickly and efficiently let you store CQ, Contest Number, and “QRZ” messages. On receive, a running 15-second loop recorder lets you stop the recording and play back the just-received audio, so you can confirm a callsign, for example. Huge Precision Main Tuning Dual! The front panel’s oversized 2.67” (68 mm) Main Tuning Knob is crafted using a brass JISC3604R alloy, for easy flywheel-effect frequency excursions or precision tuning of weak digital signals. The torque of the tuning knob shaft may be adjusted for just the amount of drag you prefer, and all it will take is one spin of the dial for you to know that you are in command of a serious radio! The 100 memories of matching-point data allow you to tune around the bands without the need to re-tune as you go. The special antenna tuner memories ensure efficient operation, as well as lightning-fast matching at new operating frequencies, as needed. The Automatic Antenna Tuner has a matching range of 16.7 to 150 Ohms (50 MHz: 25 - 100 Ohms). Personal Computer Control Softwre Available for Free Download! Just go to the "Files" tab in this area, and look for the "PCC-2000-E" Zip File. Download it for free, and enjoy your "virtual front panel" of the FT-2000/D on your computer screen. Flexible Connection Points for RTTY, SSTV, PSK31, JT65 (EME) and other Digital Modes; VOX (Automatic voice-operated TX/RX control); All mode Squelch; FM Mode: 50-Tone CTCSS Encode/Decode System; Band-Specific Repeater Shifts for 29/50 MHz FM; Wide/Narrow modes for AM and FM; Flexible, easy-to-use VFO/Memory command selections: A>B, A=B, V/M, M>A, A>M; Memory Channel Offset Tuning (MT); Versatile Scanning Capability; Versatile Menu Mode for customization of setup and features; Transverter Jack; Constant-level rear-panel sound recording jack; Comprehensive external RS-232C computer control (CAT) protocol; Optional FH-2 Keypad provides ease of control for CW or Voice Messages and Receiver Loop recording.